v I b R a T i N g your body is fun & healthy! Have you investigated the secrets of whole body vibration (WBV), in which you stand on a platform that provides gentle to challenging, constant vibration that reverberates through the body? Originally developed for Russian cosmonauts to preserve muscle and bone mass in zero gravity conditions, WBV is gaining confidence among health practitioners-particularly those who treat athletic populations and people compromised by disease, age or disability. WBV is already employed extensively in Europe and Asia. And practitioners in the United States are becoming aware of its systemic effects and therapeutic applications. 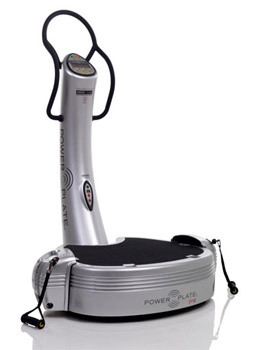 We have been using it at Optimal Health and Wellness Center in the form of Vibration and Oscillation Exercise. Vibration therapy units are either motor-generated plates or vibrational models. WBV machines typically range from 3 to 50 Hz (vibrations per second). The vibration plate works by stimulating the body's natural 'stretch reflex'. This is similar to the knee jerk reaction that occurs when the knee is tapped by a reflex hammer in a doctor's office. Without thinking about it, your body responds with a strong involuntary muscle contraction, leading to your leg 'kicking out'. The vibration platform works in a very similar way. 3000 muscle contractions per minute. The WBV platform drops either 2 or 4 mm. This is a very small and gentle drop. For example, let's say that you are standing on the vibration plate with a gentle knee bend. Once the platform drops 2 mm, your muscle is quickly lengthened, or 'stretched'. The body reacts to this by quickly contracting the muscle. By the time it does that, the WBV platform has already returned to the first position. The platform drops again and this is repeated. Since the WBV platform has been designed to do this 20 to 50 times per second, you can get a maximum of 50 muscle contractions per second! In one minute, you can actually get 3000 safe and gentle muscle contractions. This is the equivalent to doing 3000 knee bends. You can only imagine how long that would take without the WBV. Nearly 100% muscle recruitment. In addition to these muscle contractions, vibration exercise is also able to work more of the muscles. Because the vibration effect makes the muscles contract involuntarily, all muscles that are being exercised will be activated. In fact, with regular training such as weight lifting, only 40% of your muscles will be working. With WBV vibration exercise, that number can reach nearly 100%. Not only will you get more muscle contractions in a short period of time, but also more of your muscles will be working during this time. All this leads to WBV vibration exercise being a safe and fast way to exercise effectively. Like aerobic and anaerobic exercise, whole-body vibration increases physical strength, dexterity and endurance. Heightened circulation increases oxygen uptake, while mechanical oscillations create tendon stretch reflexes to stimulate involuntary muscle contractions throughout the body. Whole Body Vibration combined with enhanced air and other proprietary methods will enhance recovery, promote performance and provide a valuable parameter for emerging oxygen enhanced brain based rehabilitation applications. We call it Oxygen Enhanced WBV or Oxy-WBV. Comparable to weight repetitions at the gym, WBV can increase muscle strength and work tolerance with less effort and time for the same movement. In some cases, WBV can boost muscle strength more than ordinary weight training in a shorter time period. WBV can also be a therapeutic adjunct for people with paraplegia, cerebral palsy and muscular dystrophy. By stimulating muscles that the brain can't control, WBV helps minimize lower-body atrophy and, in some cases, reconnect the signal from the brain with previously atrophied muscles. Patients with postural problems often report new awareness and control over lower abdominal muscles after WBV sessions. In addition to whole body strengthening and improved endurance, WBV provides other key advantages. During WBV, the moving plate excites stretch receptors and tendon reflexes in joints, promoting increased receptor activity and challenging balance and coordination in a safe environment. Single-leg activities during WBV promote improved static and dynamic balance through that lower extremity. WBV can quell the effects of osteoporosis by balancing hormones and increasing mechanical stressors on bones via involuntary muscle contractions. The vertical movement stretches joints, thereby increasing space and replacing fluid between the bones, while raising critical blood flow to an area. Intermittent pressure stimulates optimal cartilage function. Like a sponge repeatedly squeezed underwater, synovial fluid is repeatedly pumped through cartilage. This improves joint mobility, eases joint stress and relieves tension. Pregnancy can soften connective tissue and pelvic floor musculature. Vibrational therapy quickly returns the hormonal system to balance while firming connective and muscle tissue. Improved blood and lymph circulation via WBV speeds healing after surgery or trauma. Serotonin release calms a patient, while HGH release speeds recovery. WBV also inhibits the loss of muscular strength during the postop period. In addition to these specific applications, whole-body vibration can return a range of systemic benefits, leading to a healthier, pain-free body. By stimulating muscle contractions, WBV promotes blood flow to increase cardiac output and overall circulation. Current research continues to demonstrate that blood cells individualize and resist clumping as a result of WBV. WBV stimulates proprioceptors to trigger muscle and joint contractions. The lymphatic system connects every organ to purify the body and strengthen immunity. The system works via the pumping action of movement and exercise, which is often limited by a sedentary lifestyle and poor nutrition. Vibration therapy stimulates lymph drainage to promote detoxification and strengthen the immune system. Some new WBV models are shaped like beds and chairs to promote healing in bedridden or nonweight-bearing patients. WBV increases the release of human growth hormone, serotonin, neurotrophin, testosterone and IGF-1, which factor into regeneration and repair. This can be helpful during significant life transitions such as menopause. Regular use of WBV can result in a trimmer, shapelier body. By increasing metabolism, blood flow and lymph drainage, WBV can dissolve excess body fat. Stagnant fat deposits are stimulated and metabolized, and HGH is elevated. Many patients find WBV sessions more efficient than lengthy aerobic workouts. The modality can motivate overweight patients and allow those with low-back pain, painful joints and other health problems to reap the rewards of an exercise plan. Contraindications include serious cardiovascular conditions, pacemakers, pregnancy, recent surgery, epilepsy, severe diabetes, acute hernia or the presence of metal implants that may loosen. Also, patients with discopathy, spondylolysis, recent infections, active tumors, painful herniated disks and recently placed IUDs, metal pins or plates should avoid WBV therapy. Vibration therapy is still a new concept and much research is yet to be performed. However, the consistent findings to date are compelling.